Hot on the heels of yesterday’s announcement I am releasing a 1st beta of the Virtual PDF printer named iPrintPDF. This virtual printer will allow you to print from any Mac or iDevices (if you use AirPrint Activator) to PDF files. The files produced will be found in /Users/Shared/iprintpdf or in your “Documents” forlder under “iprintpdf”. 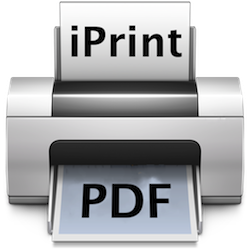 You can download the latest version from the iPrintPDF page. Just installed and worked great! Excellent! I hope it will work as well for others as it work for me. iPrintPDF is a great companion to AirPrint Activator. We will most likely integrate it in a version 3.1 of APA. This piece of software is great! I can now save email attachments to my iMac directly from my iPhone or iPad. Would be great if you could set the destination folder to whatever you wanted and if you could specify a file name for the saved file, but I’m sure those features will come in a future release. Thanks for sharing your work with the public! I hope to integrate a “Select the desired destination” feature in a next release. I might also change the name format. Right now it is based on print job ID + Date&Time + Document name. I might take out the job ID and shorten the DateTime string to a minimum.